After we went to the Holyoke children's museum we walked over to the Holyoke Merry go round. As you can see Kaden loved it and at only a $1 a ride it was well worth it. Yesterday, Kaden and I took a trip to the Holyoke children's museum with a friend. I wanted to take Micah too but they are only open 12-5 on Sunday and he naps from about 12-3 so we had to leave him home. Now that I know how much fun it is we'll be going back soon with Micah. Here's Kaden in the Shadow room. You make funny poses and when the light goes off your shadow stays on the wall. The water table is a miniature replica of the Connect river. You can barely see him over the steering wheel. Checking out Elmo's vitals...he seems to be stable. Is that Matthew McConaughey...Oh no, it can't be. He's got clothes on. They have a climbing structure similar to the one at the Boston children's museum but this one is two stories, the one in Boston is three. This one is big enough for parents to get in though which is nice for those of us who have little kids. He could have stayed in there all day. Testing out his cashier skills. Checking out an X-ray of a box turtle. This place was definitely worth the drive and for only $6 you can't beat it. Can't wait to go back! I'm not quit sure what I was thinking this morning. The kids were all driving me crazy so I threw them in the car and drove over to Funworks. A local place that's full of bounce houses. Micah is right in the thick of the terrible two's lately and can be a handful on a good day but lately he hasn't been sleeping very well and he's a MONSTER! He spent most of the time running away from us and throwing temper tantrums. Needless to say I was really looking forward to nap time today. If anyone has any tips on how I can get him to sleep past 6am I'd love to hear them. Anyway, here's the pictures. I know they're crappy. I brought my old camera because it fits in my purse but it's been dropped one to many times. I know I bias but aren't they adorable? Well, better late then never right? Here's our Halloween pictures. We took our annual trip to the pumpkin farm a couple weeks before trick or treat. Here's the babies taking everything in from the stroller. 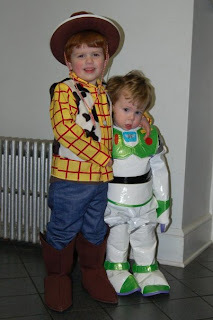 Kaden and Micah aka Woody and Buzz. 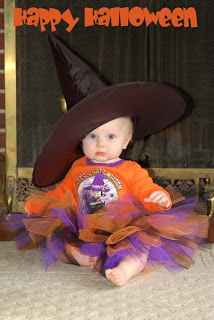 I bought the costumes last year and forgot to buy a hat for Kaden. At the last minute I had to run out and by this cheesy one. 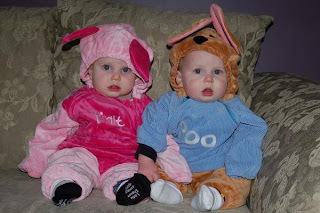 Taryn and Asher aka Piglet and Roo. Well I know I'm posting this 5 months late but we had a wonderful Thanksgiving and I've got the pictures to prove it. Homemade butter is a family tradition dating back to when my sister and I were kids. So, this year I had the boys give it a try. All you have to do is fill a clean baby food jar 1/2 full of Heavy cream. Put the lid on tight and shake it like crazy! The boys are trying to give Daddy a heart attack! 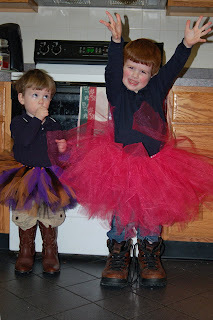 Well as much as it's killing Shaun, the boys love Taryn's tutu's and what goes better with a tutu then work boots and cowboy boots. I plan on showing this one to every girl they ever bring home. Last week my 83 year old Grandmother took a nasty fall. She broke bones in her eye socket and nose. She's very sore but she's going to be OK. Kaden decided to make her a get well soon card to cheer her up. We cut out a green strip for the stem, 4 hearts for the petals and a circle for the center. After he wrote get well I said to him " You know E's only have 3 lines" and he said "I know I wanted to make them fancy". Ok, My local mother of twins organization has an event planned at a local bounce house/mini golf/gem mining place. The owner has been gracious enough to offer us a 2 for 1 deal. We won't make any money off of it but it should help to promote our group. We would like to do something to earn a little cash too. Right now all I can think of is 50/50 raffle. Any ideas? I had the kids glue green tissue paper to baby food jars. It was taken on St Patrick's day (hence the green) It says it all, Asher sitting there quietly, Taryn and Micah goofing off and Kaden not paying any attention at all. Don't mind the mess, right before I took the picture Micah knocked over the play kitchen and shopping cart.